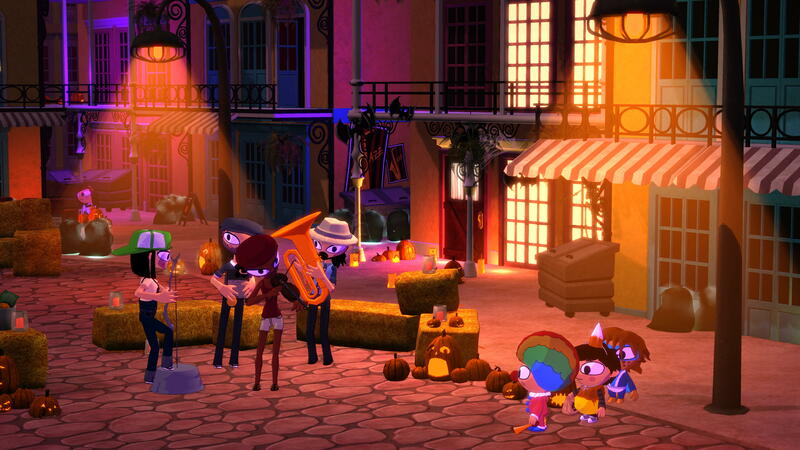 Costume Quest 2 will be out in time for Halloween. The sequel that fans have wanted since 2010 will be released this October for a large selection of platforms. Double Fine, who recently released Broken Age, announced at PAX the game will be out in October and released a new trailer. The trailer shows some of the new characters who will be in the Halloween themed RPG. One of these characters is an evil dentist. Our heroes, twins, will have to save Halloween by traveling through time. Costume Quest 2 will be similar to the previous games. Double Fine has overhauled the combat and made the world feel more connected. One example of this is your health will no longer reset after a fight, meaning you will have to monitor you health with items after battles.Costume Quest 2 will have many costumes to collect and wear. Players will also be able to preorder on Steam and receive some bonuses. These bonuses include a copy of the original game and some exclusive costumes. These exclusive costumes seem to be the original costumes from Costume Quest. Tim Schafer told Joystiq about why Double Fine is making the sequel, something they haven't done with any of their other games. "Costume Quest has a special power. Everybody thinks about it every year around Halloween. That's why we made a sequel." Tim also explained how fans have been asking for a sequel for a long time and how every Halloween the original game see a spike in sales. Costume Quest 2 will be released this October on PC, Mac, Linux, PS4, PS3, Xbox One, Xbox 360 and WiiU.